During your driving test, there will be plenty of occasions that you will be traveling towards a T-junction where the examiner will ask you to turn left. For this, they often say ‘at the end of the road (EOR), please turn left’. Incorrect procedure at junctions fail a great deal of driving tests, so it’s important to use the correct procedure, but also to use effective observation at junctions for pedestrians and cyclists. This tutorial will guide you through the correct procedure, exactly what the examiner is looking for, for turning left at a junction. Most of us are familiar with the mirror, signal, manoeuvre routine when it comes to driving. Whilst learning to drive or during your driving test, you will need to use this routine many times. When it comes to junctions however, you will need to extend this routine a little. This routine is very similar to the MSM (Mirror, Signal, Manoeuvre) routine and is known as MSPSL. This stands for mirror, signal, position, speed and look. Whilst driving, it is of course important to look closely in front at what is going on, but also vitally important to be looking as far down the road as possible for any signs that a junction may be approaching. 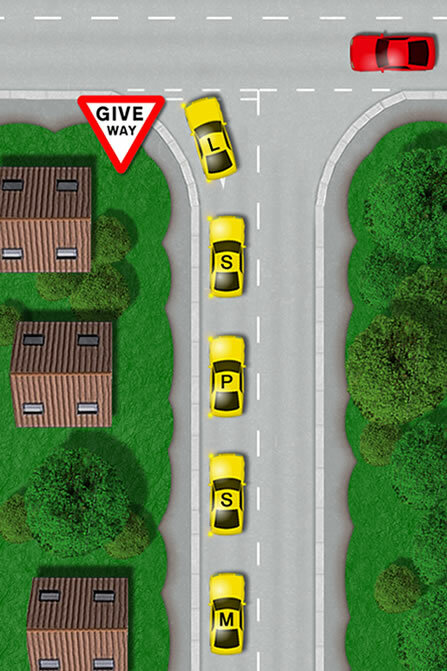 During the driving test, the examiner will ‘help’ by saying ‘at the end of the road, please turn left’. This will give you warning that a junction is approaching. If you are taking the independent part of the driving test however, the examiner will remain silent as it is for you to see that a junction is approaching. Junctions can be located by a give way sign, stop sign, traffic lights or you may simply see traffic crossing your path up ahead. Once located and approaching the junction, you will need to implement the MSPSL routine. As shown in the Turning left at a junction diagram, start with the mirrors. The examiner will expect you to look in your main interior mirror, followed by your left side mirror. You are looking in these mirrors for anything that may be approaching behind or to your left side, such as a cyclist for example. If all clear, you will now need to signal to the left. The position of your car depends on the width of the road or if there are lanes. If the road is wide enough for only on vehicles, remain in the centre of the road. If the road is wider, or especially if there is enough room for 2 cars to be positioned at the junction, keep well over to the left.Ensure you are not too close to the kerb / curb as you may risk driving onto the kerb when turning left. If that was the case, it will result in an immediate test failure. The speed of your car now depends if the junction is open or closed. Most junctions turning left, you will need to approach in 2nd gear anything from 5 to 15 mph. If the junction is closed, keep slowing down and prepare to stop and select 1st gear. Before you reach the junction line, you should be looking up and down the road you intend on taking for approaching traffic. You also need to be looking out for pedestrians as these are the most common crossing areas for pedestrians. If it is clear and the junction is open enough for you to know this, then you can remain in 2nd gear and continue turning left. If you are in the slightest doubt, stop. It is rather common for learner drivers to approach junctions too fast.As a result, they don’t have enough time to establish whether it is safe or not to continue, so ultimately have to stop. It is in fact often quicker and safer to approach a junction slowly because it allows you plenty of time to look up and down and if all clear proceed. When taking the driving test, it is better to be slightly on the hesitant side rather than too hasty. Being a little too hesitant may incur a minor or two. A minor or two for being hesitant is far better than failing for being hasty and dangerous. If the junction is closed because your vision of the road is obscured by hedges or houses etc. Move forward very slowly using clutch control. Keep looking both right and left until safe to go. It’s equally important to look to the right as there may be a car overtaking a hazard or another vehicle to your right. When you have made the left turn, you will need to look into your main interior mirror once again. The reason for this is if a vehicle is approaching from behind at high speed, you may need to increase your speed more aggressively. ensure also that your signal is off once the turn is made. If you are making a left turn at a T-junction and there is a cyclist in front not too far from the junction, hold back from the cyclist. Cyclists can often be unpredictable and could swing out to the right for a right turn. Essentially, keep behind the cyclists unless you are absolutely confident you will be able to overtake safely, in plenty of time and with ample distance from the cyclist. When turning left , do you look right first then left as that the way traffic is going ? It doesn’t matter where you look first as such, it’s more important to approach at a speed that enables you to keep looking up and down both ways until you’re confident it’s safe to proceed. Take also into account A-pillar blind spots which can easily obscure a cyclist temporarily. You only need to ensure traffic is clear in the lane that you are entering – so that would be traffic approaching from the right. But you must keep checking in both directions before moving out. There could be for example, a vehicle overtaking another vehicle on your left, which would put the overtaking vehicle directly into your lane.